Finally! Among the enormous load of reunions that has taken place over the past decade, there’s finally one that actually makes sense! Technically not a reunion in the litteral sense of the word, as guitarist Jimi Hazel and bassist Rick Skatore have kept the band going through all these years, 24-7 Spyz have (temporarily?) reunited the ‘Strength In Numbers’ lineup with singer Jeff Broadnax and drummer Joel Maitoza and will hit the European shores early next year! As you can probably tell, yours truly is very excited about this tour. First of all, I never expected to experience the Heavy Metal Soul (with significant parts of Funk, Reggae and even Hiphop) of the New Yorkers in the live environment without having to go to the US for that. Secondly, ‘Strength In Numbers’ is bar none my favorite 24-7 Spyz album – and among my all time favorites overall – and Jeff Broadnax my favorite Spyz singer (although Jimi Hazel himself is nearly as good), so having that album being central to the show is a nice little bonus I never expected to have. To hear the mind blowingly brilliant Rock song ‘Room #9’ with all the original members is a prospect that already makes me smile with euphoria. It’s nearly impossible to describe how excited I am that 24-7 Spyz will finally hit my shores, let alone in the form they chose to do it with. Now be a smart kid and visit one of the shows! As much as I despise the festive season, for you, my valued reader, an album of the week that fits these days seems appropriate. The fact that the British Thrashers of Seventh Angel are christian fits the religious origins of today’s holiday and the overall dark and somber mood of their masterpiece ‘Lament For The Weary’ responds perfectly with my opinion of the day. Let’s get back to what counts: the actual music. 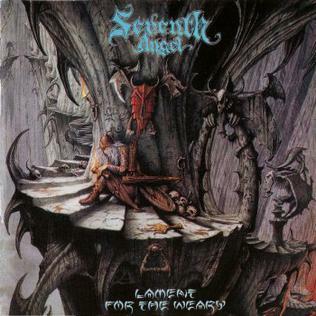 On ‘Lament For The Weary’, Seventh Angel is essentially a Thrash band, but mixes that with a distinct Doom vibe. A combination that works surprisingly well. That much is already clear when the downright brilliant instrumental opening track – with one of the best song titles ever – ‘Recollections Of A Life Once Lived’ kicks in. Especially tempo-wise, the Brits take you through a lot of interesting twists and turns, which accounts for a satisfying listen more than once. The sudden bursts of speed in the chorus in ‘Full Of Blackness’ feel like a shot of adrenalin and the intro to ‘Dark Shadows’ is fantastic in its seemingly accellerating intro, only to turn into a midtempo stomper quickly. And that speedy ending to ‘Woken By Silence’ is just pure Thrashing bliss. Two things on this album make the atmosphere. First of all, Ian Arkley’s vocals truly sound tormented. His style is not quite clean, yet his vocals aren’t exactly grunts either. Situated somewhere between Tom G. Fisher, ‘Spiritual Healing’-era Chuck Schuldiner and Lemmy in his best years with a few clean bits, he has a voice that is gruff and forceful. When he sings “I have nothing left to live for / All my friends have forsaken me” (‘Life In All Its Emptiness’), I believe him. His choice of words may help in that matter as well. Seventh Angel may be a christian band, but with the lyrics being poetic rather than preachy, the themes are universal. Even to me as an atheist. I mean, don’t we all long for salvation in one way or another? Secondly, there are these brilliant lead guitar lines over simple, yet effective doom riffs. This combination creates a sound not miles away from what Paradise Lost was doing at the time, only combined with faster paced Thrash passages. Some of these lead melodies are simply breathtaking and so are the guitar solos. Neither Arkley or fellow guitarist Scott Rawson will ever be mentioned in one breath with an Yngwie Malmsteen or a Steve Vai – except for just yet maybe – but they never play any notes that don’t need to be there, always playing in service of the song and laying down a weary atmosphere that you can’t help but be sucked into. Remarkably, all the instrumental tracks are interesting and among the album highlights. The title track is a short acoustic instrumental, but ‘Passing Of Years’ and the aforementioned ‘Recollections Of A Life Once Lived’ are well-written, well-structured and just enjoyable listens that enhance the general concept and atmosphere. In conclusion, if you – like myself – think of the holidays as nothing more than dark days, you should consider putting on ‘Lament For The Weary’. It’s one of the few Thrash masterpieces of the early nineties and finds the perfect balance between Seventh Angel’s more Thrashy debut ‘The Torment’ and their Doom-oriented, yet almost equally brilliant comeback album ‘The Dust Of Years’. Don’t let the religious label the band gets scare you away from them, because to be honest, with these guys, it only enhances their music. During this last week, I have listened to an excessive amount of Loudness material. Don’t ask me why, but I have always had a weak spot for the Japanese Metal pioneers ever since the opening riff of ‘In The Mirror’ hit my ear drums for the first time. The quartet has so many live albums and DVD’s that these make up a larger part of my Loudness collection than actual studio albums. Part of that also has to do with the poor distribution of the albums in Europe and the United States and my relatively limited budget not being strong enough to afford any Japanese import release available. Within this pile of live recordings, ‘Eurobounds’, the release documenting Loudness’ first European tour ever in 1984, stands out for me. The album arrived at exactly the right time within Loudness’ discography; the band was at their artistical high water mark after releasing their two best albums to date with the classic ‘The Law Of The Devil’s Land’ and ‘Disillusion’ and shortly before their worldwide commercial breakthrough with the ‘Thunder In The East’ album. At slightly under 40 minutes, ‘Eurobounds’ is a bit short. However, part of its power lies within the relatively short length of the album. Unlike many other live albums (including some of Loudness’), the flow of the music isn’t ruined by overlong drum solos, long audience participation passages or self-indulgent guitar solo spots. 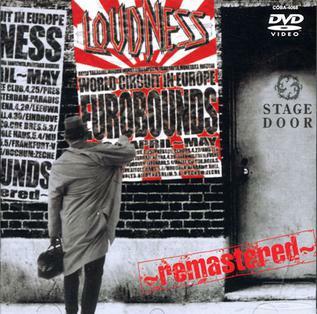 What you get here is eight powerful renditions of classic Loudness tracks. Akira Takasaki’s guitar sounds a bit more punchy than on the studio versions and the overall sound is remarkably better balanced than on any other old Loudness album save for ‘The Law Of The Devil’s Land’. In addition, the band’s choice of including eight Heavy Metal tracks was the right one. ‘Live Loud Alive’ was a perfect answer to the many live albums that were virtually recorded in the band’s back yard in the seventies and early eighties (Cheap Trick’s ‘At Budokan’, The Scorpions’ ‘Tokyo Tapes’, MSG’s ‘One Night At Budokan’ and Deep Purple’s seminal ‘Made In Japan’ to name a few), but was also slightly inconsistent due to the musical identity crisis that plagued the band’s first two albums. What you hear on this album is just pure, powerful eighties Heavy Metal euphoria. From the amazing shredfest that is ‘In The Mirror’ to the almost NWOBHM tinged ‘Crazy Doctor’, to the Van Halen-ish ‘Lonely Player’ (has anyone but me ever noticed Molly Hatchet’s ‘The Journey’ uses exactly the same chord sequence as that intro?) and the speeding frenzy that is ‘Esper’, it’s all the Loudness we’ve come to love. Akira Takasaki has a guitar style that is impressive in its blazing speed as well as its sense of melody and although he is – as always – all over the album, a special mention should go out to the late Munetaka Higuchi, who sounds more powerful than ever on this album. Minoru Niihara’s voice will always remain a matter of taste, but it’s part of the bands recognizable sound and although I sometimes can’t decipher what the hell he says to the audience (it’s supposedly English), I can’t help but enjoy it. To this day, Loudness continues to make quality Heavy Metal albums – last year’s ‘King Of Pain’ and this year’s ‘Eve To Dawn’ being the best they released since the mid-eighties – but ‘Eurobounds’ remains a perfect starting point for someone looking to discover them. It was one of the very few titles I could order within Holland, but I’m not sure if that’s still the case. This afternoon, the new edition of Gitarist arrived in the mail. It will be in stores around Wednesday and it will be the first 100 page edition of the magazine. For me as both an avid reader and a contributor to this magazine, this is a great development. More to read and more to write, what’s not to like? Edition 250 contains a few articles written by yours truly. You can now read the interview I had with Malian guitar virtuoso Vieux Farka Touré prior to his show in Amsterdam’s People’s Place, as well as the reviews I’ve written on Iced Earth’s ‘Dystopia’ album and the live double DVD’s by Paradise Lost and Orphaned Land. There’s plenty of other interesting stuff to read as well, among which a review and a background story on the reissue of George Harrison’s Gretsch Guitar and a lengthy article about ‘Hotel California’ with Don Felder’s input. If you’re not a member, check this edition out when it hits the stores. I’m proud of my contributions and can’t wait to read the other stories. For my first Album of the week publication, I think a short explanation may actually be in place. For this part of my weblog, I’d like to point out an album that I either played a lot in the preceding week or an album that caught my attention otherwise. This week, Dark Angel’s classic ‘Leave Scars’ album received a lot of spins from yours truly. Partially caused by some kind of personal crisis I don’t wish to further address here, I turned to an album that helped me out so many times ever since I got it around the age of 14. Maybe it’s the unbridled, yet intelligently composed aggression of the music, maybe it’s the deep and intelligent lyrics courtesy of drummer Gene Hoglan (more on that later), maybe it’s the rapid-fire vocal delivery of Ron Rinehart and possibly Hoglan’s mind blowing take on the drum work has played a part as well. Fact is, that the appeal the album had on me mid-puberty hasn’t faded. If anything, it increased. ‘Leave Scars’ was the second album Dark Angel released with Gene Hoglan as drummer and primary lyric writer. His debut, ‘Darkness Descends’, is probably the rightful heir to the throne many people put Slayer’s ‘Reign In Blood’ on as fastest and most brutal Thrash Metal album at the time. Though thoroughly enjoyable, it pales in comparison to the intelligent Thrash fest that is ‘Leave Scars’. The lyrics have shifted from the usual horror and death towards a strong sense of psychology and the songs feature a myriad of riffs (though nowhere near as many as on its follow-up ‘Time Does Not Heal’), instead of the standard intro-verse-chorus-solo-bridge structures. In addition, new singer Ron Rinehart’s punky rasp fits the more lyric-based approach very well, above all because he is more intelligible, which is a big pro with Gene Hoglan’s five million words a song method. For someone who usually finds lyrics of inferior importance to the actual music, I have mentioned them a lot in this post. It’s just that they’re really good. And one song in particular: the wretched masterpiece that is ‘The Promise Of Agony’. The lyrics to the song speak from the perspective of someone who doesn’t have the will to live anymore, but seems very determined and powerful when reviewing his choices. These (enormous amounts of) lyrics touched me the first time I heard them and they still do now. Especially when combined with the great riffs – check out that monumental opening riff – and the intense vocal delivery of Rinehart. Not that ‘The Promise Of Agony’ is the only good song on the album. Opening track ‘The Death Of Innocence’ is a neck breaking, full speed Thrash monster featuring one of the fastest vocal patterns I’ve ever heard looking into the twisted mind of a child molester. ‘No One Answers’ and ‘Older Than Time Itself’ are monstrous epics that cry out for the power of the individual, a power displayed in the forceful closing title track. Guitarists Jim Durkin and Eric Meyer throw riffs around as if their lives depend on it and they’re so intensely aggressive that even the instrumental ‘Cauterization’ remains awesome throughout its epic length. Dark Angel would continue to evolve into even more epic proportions on the brilliant follow-up ‘Time Does Not Heal’ (famously advertized as having 246 riffs, a number which is – according to Gene Hoglan – completely accurate), but the album that still captures both Dark Angel’s forward-thinking approach as well as their boundless aggression as a combination best is ‘Leave Scars’. Good day to whoever reads this! When you have reached this weblog, you probably know me personally or at least know of my work, either my journalistic or my musical endeavors. Whatever the case, I’d like to thank you for taking some of your precious time to visit my little digital playground. Some of you may be wondering why I have set up this weblog, being typically cynical of many digital developments that have been going on throughout recent years. However, I felt the need to set up a little spot where I can keep those who are interested informed about both my musical and journalistic publications and work-in-progress. Since some people around me have expressed interest in such updates and me – ironically, for a journalist – being below average in keeping people updated, this seemed a good solution. The people I am talking about know who they are and I want to thank you for giving me this little push that I sometimes need. Things I plan to publish on this blog are announcements on my articles featured in (mainly) Gitarist and Interface, a look behind the scenes on the songs I’m working on either by myself or with my friends in Chaos Asylum and maybe some news facts that I may find interesting to further point out. I guess I am what people call a muso, so some of my ramblings may seem interesting to me, but aren’t to you. Please bear with me in that case! Starting things off properly, my first post will be an “Album of the week” post. I will plan to make this a weekly thing, but the past has proven that I’m not always good at keeping up with that frequency. That one will follow shortly after this post. Once again, I’d like to thank all of you for stopping by and please leave a note if you have!